This week DOW Jones just lost nearly 10% in 6 trading days in response to China’s crash — a dive that many saw coming, because when China sneezes, the rest of the world gets a head cold. While it has recovered somewhat in the past 24 hours, this kind of volatility is enough to shake even the most confident investors. Granted, it’s not like current investors are unaccustomed to these kinds of occurrences; the last 15 years have been a wild ride, to say the least. From the bursting of the tech bubble to the 9/11 terrorist attacks, the crash of 2008 to what now what appears to be the result of a slowing Chinese economy…it all sends shockwaves throughout the rest of the world, impacting our domestic market — and your individual portfolio. So what can you and I do about massive volatility? Two words: Asset Allocation. Sure, we have all heard that phrase before. But lets look at a recent example of just how asset allocation allowed us to navigate the roughest market waters. From January 1, 2000 to the end of 2009, we experienced what experts call “The Lost Decade.” By “lost,” we mean that the stock market (I.e., the S&P 500) was essentially flat. If you started with $100,000 and invested solely in U.S. stocks, your investment would have declined to $93,717 a full ten years later. However, as famed investing veteran Burton Malkiel pointed out in a Wall Street Journal article titled “Buy and Hold Still Works,” if you would have started with $100,000 and owned a well-diversified basket of low-cost index funds, rebalancing them just once per year, you would have grown your $100,000 to $191,859 during the same 10-year period. 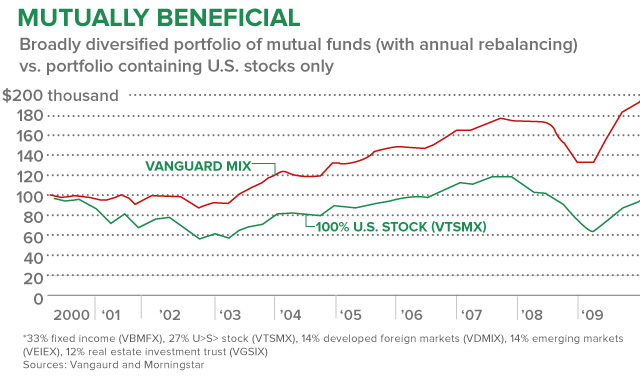 That’s an annualized return of 6.73% during what most called the Lost Decade. So what is the key action to take during a period of volatility? Stay the course. Resist the temptation to turn and flee. Refuse to join the herd and make illogical decisions based on your emotions – and continue to make contributions to your 401(k) or other investment accounts. Consider this: When you continue those contributions in a down economy, you are essentially buying stocks at a discount! Most experts would highly recommend that you also use the guidance of a fiduciary advisor, one who is obligated to put your best interests first – and who will be there to talk you off the ledge when the market is acting up. To get connected to a high quality advisor (and a complimentary portfolio review) visit PortfolioCheckUp.com.